Larry Bird was born on December 7, 1956. He was the fourth of Joe and Georgia Bird's six children. His birthplace, West Baden, Indiana, is a small village just outside the slightly larger town of French Lick, Indiana, which a had a population of two thousand. French Lick was once a famous resort community that people visited for its mineral springs (healthful waters). French Lick had fallen upon hard times by the time Bird was a youngster. His father managed to find factory work in the town, but the Bird family always struggled to make ends meet. The Birds had enough coal to stay warm, but many nights the old furnace would break down. The house would fill with black smoke, and the family would all have to stand outside, freezing, while Joe Bird tried to fix things. Bird and his brothers played all sorts of sports, including baseball and softball. In fact, Bird did not settle on basketball as his primary sport until he was in high school. When he realized he might excel in the sport, he began to practice day and night. "I played when I was cold and my body was aching and I was so tired," he told Sports Illustrated. "I don't know why, I just kept playing and playing.… I guess I always wanted to make the most out of it." Bird sharpened his talents in one of the most demanding basketball arenas. In Indiana, the sport reigns supreme. When he was in high school in French Lick, he played guard during his sophomore and junior years. He showed no great ability at the time, and at 6 feet 3 inches (1.9 meters) he was not especially tall. By his senior year, however, Bird had grown four more inches. At 6 feet 7 inches (2 meters) he became an impressive physical specimen and retained his agility (ability to move quickly) and hustle (speed, drive). Many universities wanted him for their teams, but Bird decided to stay at home. He entered Indiana University in the fall of 1974. Bird lasted only twenty-four days at the college. He felt uncomfortable about the size and the impersonality (lack of emotion) of the school. He returned to French Lick and entered junior college there, but within two months he had dropped out of that college as well. Bird had a short marriage that ended in divorce. In order to support himself and his daughter from that marriage, Bird took a job with the City Department of French Lick. He drove a garbage truck and helped to maintain parks and roads in the district. Such work may have seemed a low point to some people, but Bird told Sports Illustrated that he actually enjoyed it. "I loved that job," he said. "It was outdoors, you were around your friends.… I felt like I was really accomplishing something. Had the chance to make my community look better." Bird faced personal loss during the same period when his father committed suicide. After that tragic event, Bird decided to return to college. This time he went to Indiana State. He had little confidence in his academic abilities, but felt that he could help the basketball team, the Sycamores. By that time he had grown another two inches. He was 6 feet 9 inches (2.1 meters) in height and weighed 220 pounds (99.9 kilograms). Bird had to sit out his first season at Indiana State because of rules having to do with players moving from one school to another. That year the Sycamores went 13–12 (won thirteen games and lost twelve). When he was allowed to play in the 1976–77 season, his first year on the team, the same Sycamores earned a 25–3 record—their best in almost thirty years. When he was at Indiana State, Bird became the most talked about college player in the country. Bird always played with and for the team and always shared his fame with his fellow players both on and off the court. The Boston Celtics drafted Bird in 1978. He had the option of playing professional basketball right away, but he chose to stay in school and finish his degree. The Celtics worked out a deal for Bird after his graduation. The contract signed on June 8, 1979, gave Bird $650,000 per year for five years, a total of $3.25 million. This sum was a record for a rookie (first-year player) in any sport. The Boston fans made no secret of their expectations for their new headliner. Bird did not disappoint them. break throughout his career. He helped the Celtics regain their position as a basketball superpower. He made the NBA All-Star team his first year, played in every regular season Celtics game, and led the team to a first place finish in its league. Bird was named Rookie of the Year and finished third in the Most Valuable Player polls. Those who had predicted that Bird could never turn Boston around had to take back their statements. After Bird's first year, the team played in the championship series again and won in 1981, 1984, and 1986. The Celtics' games at the Boston Garden (their home stadium) were sold out for years because fans wanted to watch Bird play. Bird was never the flashiest of players in the NBA. He was not very fast on the court and was not a remarkable jumper. Bird has achieved greatness the old-fashioned way—by being consistent, by contributing not as a grandstanding superstar but as a team player, and by attacking every game with every ounce of effort. He spent hours practicing both with his team and alone. Sportswriters and fans alike have been amazed at how Bird knew the game, the basketball court, and where the ball was going to be. His timing and feel for the game was exceptional. He always seemed to know where he should go and where he should be. Bird was always somewhat injury-prone. He missed much of the 1988–89 season after major surgery on both heels. He continued to battle back problems and other injuries throughout the next few seasons. He retired from the Celtics after a thirteen-year career. He played his last game of basketball as a member of the U.S. Olympic Dream Team (a basketball team made up of U.S. superstars) at the 1992 Summer Olympic games in Barcelona, Spain. After retiring as a player, Bird worked for the Celtics as a consultant. 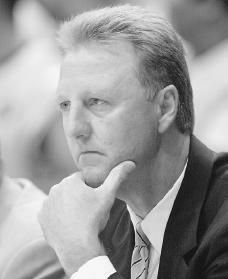 In 1997, Bird returned to his home state of Indiana and became the coach of the Indiana Pacers. He led his team to the Eastern Conference finals in 1998 and 1999; in 2000, the Pacers lost to the Los Angeles Lakers in the finals before Bird stepped down as coach. Bird, Larry, and Jackie MacMullan. Bird Watching. New York: Warner, 1999. Bird, Larry, and Bob Ryan. Drive. New York: Doubleday, 1989. Shaw, Mark. Larry Legend. Lincolnwood, IL: Masters Press, 1998. Hey, this was really helpful for my school project on Larry Bird. DID LARRY EVER MARRIED AND DOES HE HAVE CHILDREN? I GREW UP WATCHING THE FUED BETWEEN MAJIC AND LARRY. Does Larry Bird have a brother who is developmentally disabled?